Stanley R. Bazan, son of Polish immigrants John and Magdalene Bazan, was born on February 7, 1919, in East Chicago, Indiana. Bazan was the catcher for the Washington High School varsity team in East Chicago. In 1939, aged 20, Bazan signed with the Chicago White Sox organization and was assigned to the Jonesboro White Sox of the Class D Northeast Arkansas League, where he batted .336 in 102 games with 10 home runs. In 1940, he joined the St. Joseph Autos of the Class C Michigan State League, and batted .264 in 86 games with 15 home runs. The following season with the Autos, he hit .320 in 81 games and clouted 16 home runs. In 1942, he climbed to Class B baseball, firstly with the Pensacola Pilots of the Southeastern League, where he hit a lowly .193 over 57 games, and then with the Springfield Browns of the Three-I League, where he raised his average to .275 over 23 games. Bazan joined the Marine Corps at the end of the season. He served with the 21st Marine Regiment of the Third Marine Division in the Pacific. 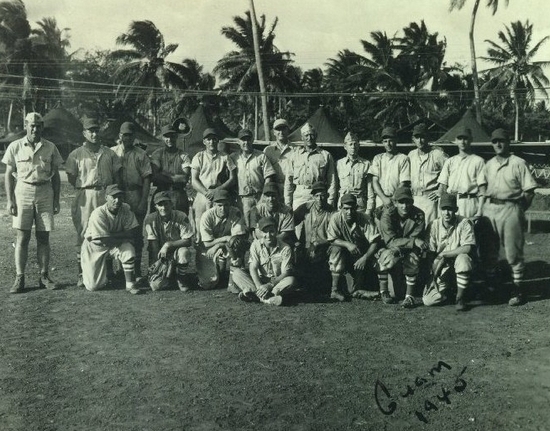 After the Japanese were defeated on Guam in August 1944, the Third Marine Division set-up camp on the island, and Bazan had the opportunity to play baseball and softball. The Division All-Stars played a series of exhibition games, and even traveled by air to neighboring islands for games against the Second Marine Division. In February 1945, Bazan packed away his catcher's mitt and left the safety of Guam for Iwo Jima. Iwo Jima, 750 miles south of Tokyo, is the middle island of the three little specks that make up the Volcano Islands. Five miles long with Mount Suribachi at the southern tip, the island was about as inhospitable as could possibly be imagined. The sulfur-reeking island was scattered with steep and broken gullies that cut across the surface and were covered by scraggy vegetation and a fine layer of black volcanic ash. The Japanese had no doubt about the importance of Iwo Jima - one of their last outer defenses shielding the home islands - and were determined to keep control. With a garrison of around 22,000, under the control of Lieutenant-General Tadamichi Kuribayashi, the Japanese took advantage of the island’s natural features and turned it into a fortress of underground tunnels and defensive bunkers, riddled with concrete pillboxes, machine-gun pits, trenches and mortar sites. A three-day US Navy bombardment barely caused a scratch and the Marines met fanatical resistance when they hit the beaches on February 19, 1945. Private First-Class Bazan was a machine-gunner and took a Japanese bullet through the right shoulder. He was evacuated to a hospital at Guam. Bazan was luckier than the pitching ace of the Third Marine Division All-Stars. Jimmy Trimble, property of the Washington Senators, was killed in action during a savage attack by fanatical Japanese troops on March 1, 1945. Stan Bazan also lost his brother, Joseph, who was killed in action in Europe with the 101st Airborne Division in September 1944. Despite the wound, two months later Bazan was again playing baseball for the Third Marine Division team, which was now being coached by Pee Wee Reese. "The Browns have a good prospect in Bazan," said Reese. "He handles a pitcher well, has a strong, accurate arm and hits all sorts of pitching." "Naturally there was some doubt in our minds about Bazan," said the team's other coach, Lieutenant Angelo Bertelli. "But it has been removed. He is none the worse from his wounds and hospitalization, and looks mighty good behind the plate and at bat." Bazan was close to 27 years old when he returned home after the war. Instead of further pursuing a career in organized baseball, he chose to play the semi-pro game. He joined Taylor Edgell's Benton Harbor American Legion club in the Michigan-Indiana League in 1946. A league that included the St. Joseph Autos, for whom Bazan had previously played when they were in the now defunct Michigan State League. Bazan continued playing semi-pro baseball into the 1950s, with stints for Michigan City in the Michigan-Indiana League, and his hometown East Chicago Taps in the Calumet Industrial League. Stan Bazan passed away on August 20, 1962, in East Chicago, Indiana. He was just 43 years old and is buried at Holy Cross Cemetery in Calumet City, Illinois.